A big well done to our 3 JRSO reps who helped orgainise our new Park Smart banner. The new banner is now located on the railing at the pedestrian exit to our school. Our JRSOs worked with Sustrans, the City of Edinburgh Council and our Parent Council to make our new banner. We had great fun when the local newspaper came to take pictures of us for the paper. It will hopefully go towards keeping our children safer. Many thanks again and keep up the excellent work. 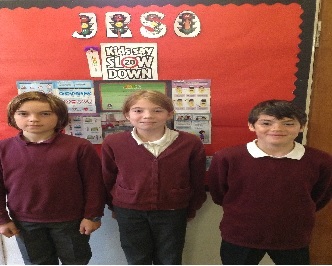 JRSOs (Junior Road Safety Officers) are P6/7 pupils who are responsible for promoting Road Safety in school. The 2016-17 JRSOs are Grace, Angus and Glenn. 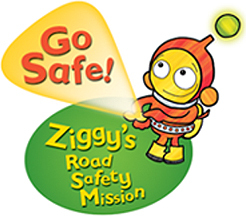 The JRSO mascot is an alien from outer space called Ziggy, who is learning all about Road Safety! So far, our JRSO reps are going to soon attend the JRSO launch event at the City Chambers, where they will meet and share ideas with other JRSOs from schools across Edinburgh. They are also visiting classes to introduce themselves, explain a little more about JRSO and launching a slogan competition. The winning slogan will be printed on a large banner and hung on the pedestrian barrier outside the school entrance to help motorists remember to park safely. To help everyone at St Margaret’s learn more about Road Safety, the JRSO team will be running lots more fun competitions throughout the year. Special JRSO goodie bags will be up for grabs! For more information about JRSO and road safety check out the JRSO notice board! 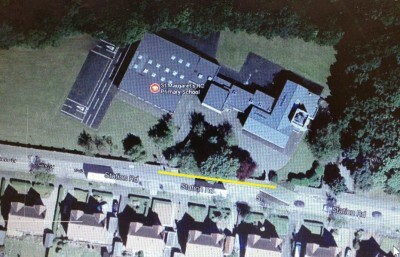 Dear parents and visitors please could we ask you not to park in the area indicated in yellow on the picture below. It is vitally important that our Lolly pop lady and the school bus have access to this area.